3. Assistant Engineer (Electrical) PWD - A degree in Electrical Engineering or Electronics and Communication Engineering OR A pass in Sections A and B of the Institution Examination with Electrical Engineering as a subject. 4. Assistant Engineer (Civil) in Highways Department - A degree in Civil Engineering OR A pass in Sections A and B of the Institution Examinations under Civil Engineering Branch. 5. 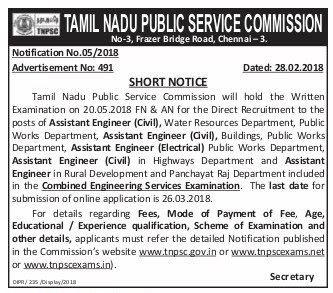 Assistant Engineer in Rural Development and Panchayat Raj Department - A degree in Civil Engineering OR A pass in Sections A and B of the Institution of Engineers (India) under Civil Engineering Branch, subject to the condition that he/she should furnish evidence of having undergone practical training in surveying for a period of not less than one year. (b) The above mentioned age concession will not apply to the Ex-servicemen applicants those who have already been recruited to any class or service or category.